Jazz up your spring with the class & sass of Sally B. 's Dashing Revue! 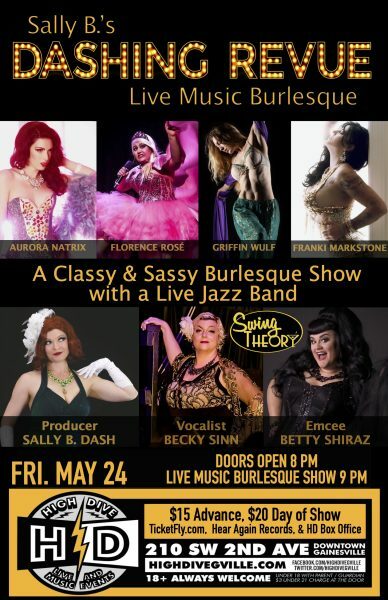 This one of a kind show features dazzling burlesque performances by local and touring artists with live music by local jazz sensation Swing Theory. You'll laugh, you'll gasp, you'll scream wildly... guaranteed! Featuring Performances by: Aurora Natrix Franki Markstone Florence Rosé Griffin Wulf Sally B. Dash With your Host Betty Shiraz Featuring vocalist Becky Sinn and Live Music by Swing Theory! Fancy Dress Encouraged! Tickets available online, Hear Again Records ($1 FEE), & at the High Dive Box Office (NO FEES! ).